If You Give a Mouse, Math Madness, Oh My! This year we are trying to take our advent calendar beyond chocolate. We’ve added some fun activities, click here for a free printable list of ideas. 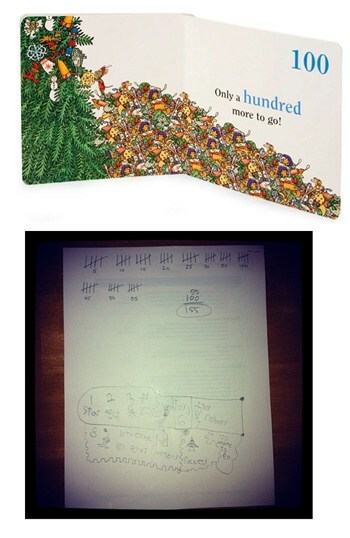 In the past we’ve always used the advent calendar as a math tool. We’d work on number recognition, counting, etc. This year our girls are just too far beyond those tasks to have there be any challenge. This morning Quinn read Merry Christmas, Mouse! (From the If you give a… series). This simple board book visually displays Mouse slowly putting up holiday ornaments in numerical order: one star, two angels, and so on, to ten. A light bulb went off in my head; seriously, the way you’d see it portrayed in a classic cartoon. I asked, “How many ornaments does Mouse have?” I quickly grabbed some paper & pencils and asked the girls to show me how we could figure it out. You can see our work to your right. Quinn drew and labeled the 10 items and noted the “100 more” listed on the final page. We used tally marks and practiced counting by fives. We calculated Mouse owns 155 holiday ornaments, what fun! I realized that having a daily holiday math problem in our advent calendar that the girls could work on, before popping down their M&M’s, was a great alternative to just counting the days. There are many excellent examples if you search the web. 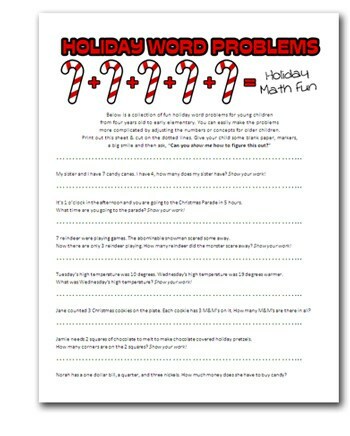 I pulled together some fun ideas and created 25 holiday problems for the month of December. I know the month has already started, but this was too fun to pass up sharing. Happy problem solving, may the force of the candy cane be with you! check out some of the fun examples below! My sister and I have 7 candy canes. I have 4, how many does my sister have? Show your work! It’s 1 o’clock in the afternoon and you are going to the Christmas Parade in 5 hours. What time are you going to the parade? Show your work! 7 reindeer were playing games. The abominable snowman scared some away. Now there are only 3 reindeer playing. How many reindeer did the monster scare away? Show your work! Tuesday’s high temperature was 10 degrees. Wednesday’s high temperature was 19 degrees warmer. What was Wednesday’s high temperature? Show your work! Jane counted 3 Christmas cookies on the plate. Each cookie has 3 M&M’s on it. How many M&M’s are there in all? Jamie needs 2 squares of chocolate to melt to make chocolate covered holiday pretzels. How many corners are on the 2 squares? Show your work! Norah has a one dollar bill, a quarter, and three nickels. How much money does she have to buy candy? Joey, Jamie, and Maggie went to see a Christmas movie at the theater. Each ticket cost $5. What was the total cost of the tickets? Show your work! I saw 3 reindeer out in the snow. How many legs did I see? Show your work! I have 8 ornaments, half of them are red. How many are red? Show your work! Today is Monday and Nya’s birthday is on Friday. How many days until her birthday? Show your work! Alex gave donated money to the Salvation Army by putting coins in the red bucket. He put in a nickel and 4 pennies, how much money did he donate? Show your work! Draw two triangle Christmas trees, how many corners are there altogether on the two trees? Show your work! John has 9 ornaments. 6 are green and the rest are red. How many ornaments are red? Show your work! Sam ate 7 cookies and Jordyn ate 2 cookies. How many more cookies did Sam eat than Jordyn? Show your work! Kyle got 4 new puzzles on Christmas. If he already had 5, how many puzzles does he have now? Show your work! Candy canes are 5 cents. How many candy canes can you buy with 10 cents? Show your work! I have 12 pieces of chocolate and 3 gift boxes. If I want to be fair and give each child the same amount how many chocolates would I put in each box? Jenna’s cookie jar had 10 cookies in it. She baked 14 more cookies. When they cooled, she added them to the cookie jar. What is the new total number of cookies in Jenna’s cookie jar? Show your work! Rose got 8 presents for Christmas. Quinn received 6 gifts. How many more presents did Rose get? Show your work! James got a new camera from Santa. He took pictures of his cousins. He took 6 pictures of boys and 8 pictures of girls. How many pictures did he take in all? Show your work! Wayne’s mother gave him $20 to spend on Christmas presents at the store. He bought a book for $10 and a candy bar for $1. How much did Marie spend in all? Show your work! The children want to draw Christmas cards. Alec, Sarah, and Jenny each have 4 markers. How many markers do they have in all? Show your work! Chad had a string of holiday lights with 8 light bulbs, 5 of the bulbs are burned out. How many lights are glowing? Jonny wants to have hot chocolate with marshmallows. His cup has 8 mini-marshmallows and his mom’s hot chocolate has 4 big marshmallows. How many marshmallows do they have in all? Show your work!